Fourth Edition - Fully Up to Date for jQuery Mobile 1.4! — Todd Parker, jQuery Mobile Team. Web development and design professionals who want to start building apps for mobile devices. Anyone who wants to get up to speed quickly with jQuery Mobile. The 567-page eBook in PDF format. Read it on your desktop, tablet or phone with ease. A zip file containing the code examples, so you can follow along with the book. Free lifetime updates for the eBook. Matt Doyle is an experienced technical author and coder who has written two well-received books on Photoshop and PHP. How can jQuery Mobile help you build better mobile websites and web apps? You'll learn about the concepts behind mobile web apps, discover how jQuery Mobile can speed up your app development, and find out how to install jQuery Mobile and get up and running quickly. Early in the book you dive straight into the action, and use jQuery Mobile to build a simple yet fully-functioning mobile website in a snap. Discover how to build mobile-friendly pages, buttons, toolbars, dialogs, popups, panels, tabs, responsive tables, forms, interactive listviews, and more. Explore jQuery Mobile's rich theming system that lets you give your mobile apps a totally unique look and feel. Learn how to use the ThemeRoller tool to design themes quickly and simply. You bring all this knowledge together and learn how to create a fully-functioning, multi-user task manager app from the ground up using jQuery Mobile, PHP and MySQL. Finally, you also discover how to build a native iOS app using jQuery Mobile, PhoneGap and the Google Maps API. You can use these techniques to build native apps for iOS, Android and other platforms that you can then sell through stores like Apple's App Store and Google's Android Market. The Fourth Edition of the book is fully updated for jQuery Mobile 1.4, PhoneGap 3 and Xcode 5. It covers all the latest features and widgets in 1.4, including the easier theming system; the new panel, tabs and flipswitch widgets; the new filterable widget for filtering any type of content, and lots more! Find out more: Download the table of contents and a sample chapter. — Nora Brown, Web Designers' Review of Books. — Todd Parker, jQuery Mobile Project Lead. — Darren Clark, Technical Director, Webling Interactive. — Jonathan Christopher, Monday By Noon. 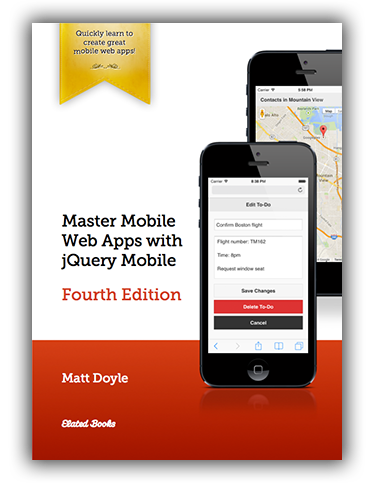 March 18, 2014: The fourth edition of the book is out, fully updated for jQuery Mobile 1.4! Buy it now. January 13, 2014: jQuery Mobile 1.4 is now out! Learn about the most important new features in 1.4, and how to use them in your mobile apps. October 8, 2013: The fourth edition of the book is coming soon. Covers all the fun new stuff in jQuery Mobile 1.4! Buy the third edition today and receive the fourth edition for free once it's published. March 1, 2013: jQuery Mobile 1.3 is now out, with responsive grids & tables, a new panel widget, form field improvements, and more! Find out how to take advantage of the new features in 1.3. When you purchase this eBook, you're automatically registered for free lifetime updates. If we publish a new edition of the book at some point in the future, we'll drop you an email with a link to download the latest edition for free. Please note that we are not currently planning to publish any future editions of this book. We want you to be delighted with your purchase of this eBook, and we invite you to try it risk-free. 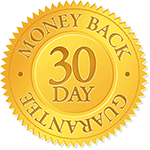 If, for any reason, you are not happy with the eBook, simply contact us within 30 days of the date of purchase, and we'll refund your purchase price in full. Registered Office: 30 Missingham Parade, Robertson, NSW 2577, Australia. Registered in Australia. ABN: 77 346 357 526. Phone: +61 2 4885 2404. Email: orders@elated.com. All prices are in US dollars unless otherwise indicated.